All new products at a glance. Let our light tell you a story - light is so much more than mere lighting. Convert service life specifications and calculate your individual maintenance factor. We’ll keep you up to date. Get here all press articles and downloads. In large floor areas, side windows are often insufficient to supply the complete depth of the space with daylight. In this project, the central foyer was even originally cut off completely from any daylight. 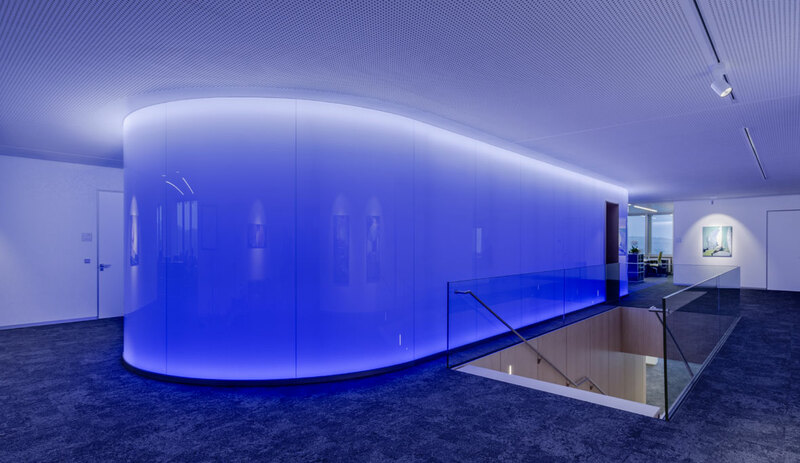 In its present condition following a redesign for the boardroom, the storey not only has views from one window facade to the next but also a large LED luminous wall in the foyer. Highly diverse light scenes can be dynamically projected onto the wall with over 100 m2, and it can also be statically illuminated. The large-format light object gives the room a prestigious character, and has dispelled the extreme, unattractive contrast between the bright areas near to the fenestration and the centrally located dark zone. A certain jealousy cannot be denied – those working or visiting the boardroom of this company in Koblenz enjoy a wonderful view, because 15 storeys down is a breathtaking landscape encapsulating the flowing together of the Rhein and Mosel rivers. The architects redesigning the boardroom level naturally wanted to emphasise this panorama, but they also desired more brightness and transparency across the complete storey. This was no problem at all in the office areas located behind the facade, as these benefit from a high ingress of daylight through the windows. On the other hand, the functional and access zone located deep in the inner of the building was a challenge though. "The initial situation was that this area serving as the foyer was panelled with dark wood and completely cut off from daylight – it was lit with artificial light only," explained Jörg Wagner from Fries Architekten, Vallendar. To create a daylight-based situation in the room depth, a section of the peripheral wall was opened up to the facade in all four directions of the compass. This enables natural light to penetrate into the depth of the building and also provides views towards the outside from the foyer. To support the impression of a naturally illuminated space instead of counteracting this with individual luminaires in or on the ceiling, the architects drew up a highly special concept in tight cooperation with the lighting designer Torsten Braun from Die Lichtplaner, Limburg. 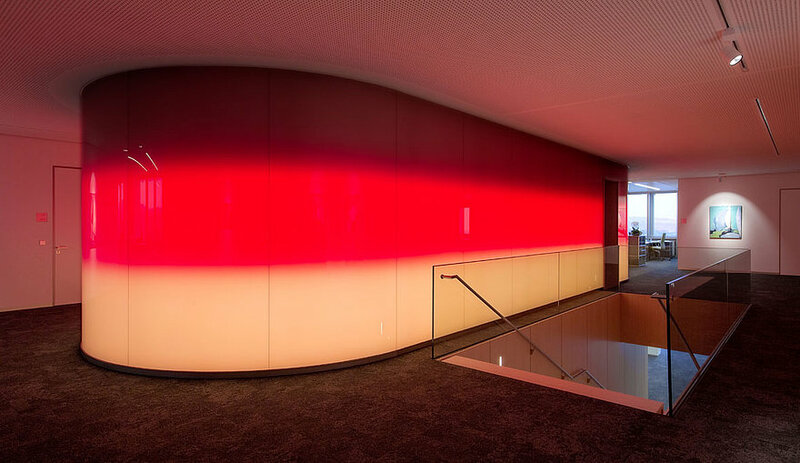 The foyer in the boardroom storey is now illuminated with a large luminous wall that can be configured with dynamic scenes instead of individual luminaires. 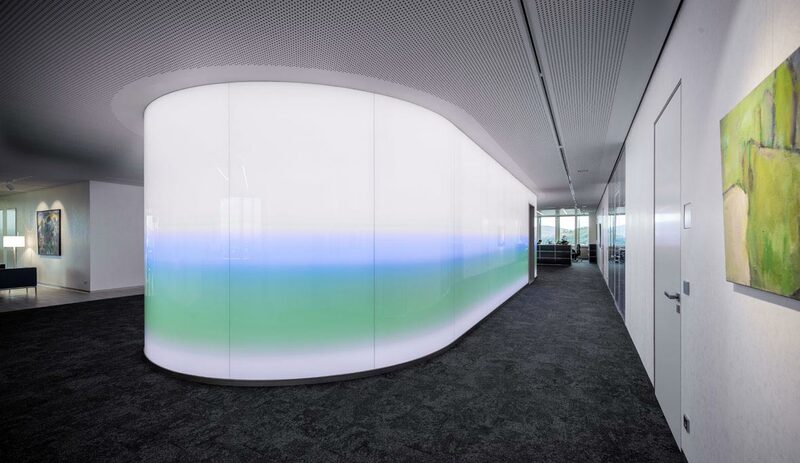 The wall surrounds a space with an elliptical layout that accommodates a kitchenette, photocopying machine and server space, while the fenestrated outer shell serves as a projection screen for diverse light scenes. It is also possible to configure lighting conditions in this room zone that comply with current standards without installing other luminaires. Around 60,000 LEDs are located behind the glass lamination and opaque film layer to form a matrix of pixels with each point consisting of a red, green, blue and white LED. These RGB+W LEDs can be set to various colour and dimming values using DMX control. 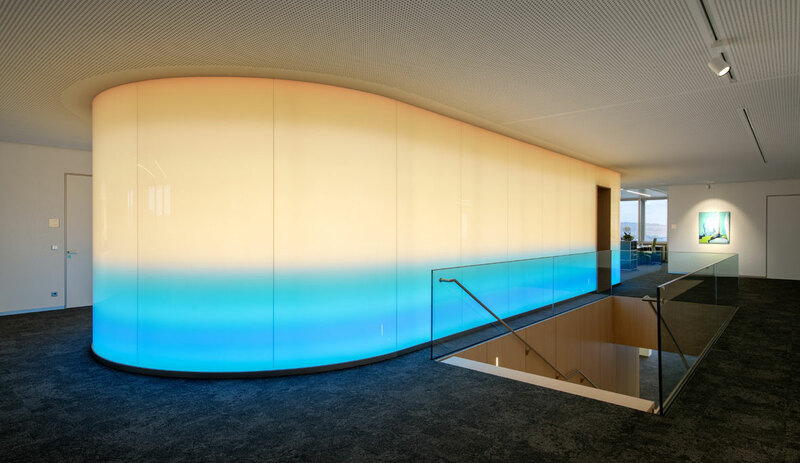 Users can therefore choose whether they use the wall as a homogeneously illuminated surface or whether they project it with static or dynamic images and patterns with low resolution – the light object definitely creates impressive effects in the space. The LED wall creates a fine balance between the bright areas near to the windows and the depth of the building. As a sophisticated light object, it also lends the foyer of the boardroom level an appropriately prestigious character and provides a warm welcome for visitors. and a view of the Mosel for example. "We wanted to link up to specific images from nature with these light scenes that then release positive associations," explained the lighting designer Torsten Braun. "Because the LEDs surround the wall in horizontal rings, the horizontal layering of colours in the broad landscapes could be wonderfully simulated." The surface can of course also radiate uniformly with a single colour as well - a cool blue, warm orange or a white tone can be selected according to user preferences for example. A soft, automatic transition across the course of the day can be activated for many light scenes, thus also establishing a link to the dynamic window light from the sky here in the fifth floor.